Replacing aging vehicles is one of the most pressing problems in the transportation industry. Many districts and contractors are struggling with how to get out from under their old vehicles due to budget cuts that are negatively impacting school transportation funding. Thanks to a new $50 Million “Bus Buyback” program developed by Transportation Services Company (TSC), school districts and transportation contractors now have the opportunity to benefit from TSC’s economies of scale in terms of vehicle pricing to gain access to capital that can help address the dire need to modernize their fleet. Under the new program, TSC can purchase select vehicles or an entire aging fleet, and then lease a new fleet of vehicles to school districts and transportation contractors, thereby enabling them to provide more cost-effective, reliable and safer transportation service. - Reduce overall maintenance costs by lowering the average age of the fleet and replacing vehicles that are in poor condition or have exceeded their useful life. - Better fuel economy with younger vehicles. - Newer vehicles and a proactive preventive maintenance program create less service down time. - In many markets, mechanics are in high demand and limited in number. When utilizing a safer and more reliable fleet, less resources are needed to manage day-to-day operations. - Most bus acquisitions are made with a cash purchase, thus prepaying for 12-15 years’ worth of use. - TSC’s bus buyback program utilizes a tax-exempt, municipal leasing option where the school district or transportation contractor can pay for the new buses as they use them. The TSC buyback program is a great opportunity for cash flow-focused contractors and budget-restricted school districts to utilize leasing and financing solutions that can be customized to fit their operation’s unique needs and circumstances. 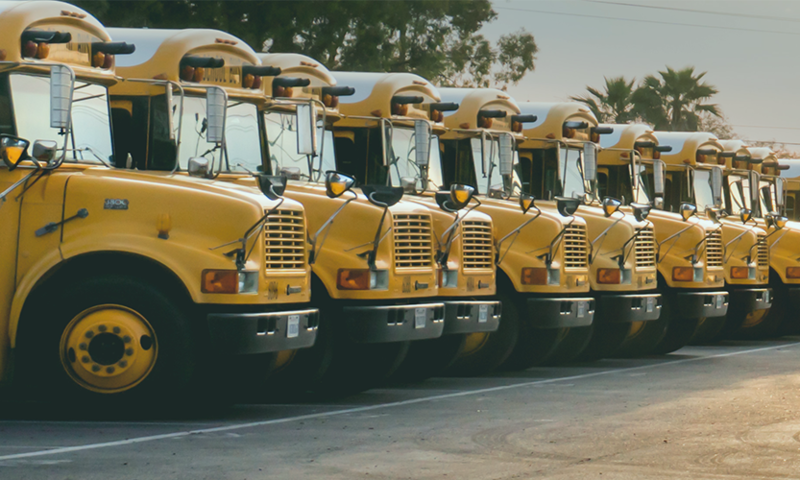 Cutting costs and increasing efficiencies across the entire spectrum of a school bus fleet ensures that an organization gets the most out of the total cost of ownership associated with their current assets. An organization’s often unsafe, aging fleet does not have to take focus off of the top priority of providing a quality education to the school children of their community. To learn more about Transportation Services Co. and the $50 Million Bus Buyback Program, visit our online resource center or give us a call any time at (888) 518-3377.